In this one locale, a phenomenal concentration of history, legend and monuments coexists with an equally phenomenal concentration of people busily going about their everyday lives. While tourists visit the Vatican, the Forum Romanum and the Trevi Fountain, many visitors often miss the many other sights that make the whole of Rome a museum—a living museum with a population of three million, with rich art, literary, music, theatre and food traditions. Have you ever wondered what it was like to live in ancient Rome? In this course we will review the evidence and sources for ancient Roman daily life, with a particular focus on life in Imperial Rome, from Augustus (c. 31 BCE) through the reign of Caracalla (c. 217 CE). Specifically, you will “become” an ancient Roman from a particular district (regio) in Rome. You will create a persona, learn all that you can about this individual’s status, calling, background, family, aspirations, skill sets, diet, likes, dislikes, and so on. In addition to this persona, you will choose a cultural institution, or concept (e.g., the cursus honorum, the Vestal Virgins, Roman religion, Roman sexuality), and learn all you can about it. Next, armed with your newfound knowledge, you and your classmates will create a group project, a Rector Rudis (“Rough Guide”) to Imperial Rome and its environs for ancient tourists, employing digital mapping tools and Canvas/WordPress/Google Docs. The saying “A tavola non s’invecchia” (“One doesn’t age at the supper table”) expresses the importance of food and eating for Italians. In this course, we will examine the relationship between food and culture in Italy from pre-historical times to the present, through a variety of readings, class discussions and some personal and practical experience. The study of food culture is interdisciplinary—even though the historical point of view will be primary, during our readings, class discussions and lectures we will touch upon many fields: sociology, literature, art, music and philosophy. 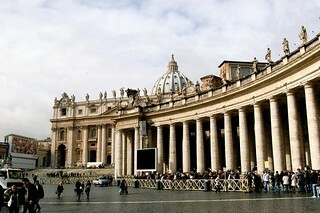 In addition students will undertake a group-learning project around Rome that will enhance their classroom experience. Field trips (cheese, wine and olive oil production) and cooking classes will be included in the experience. This course is an overview of the history, culture, society and politics of Italy from the end of World War II to the present, with special attention to contemporary issues. Italy is not a settled place, with strong regional differences and political and economic interests. It has an economy that is not well, with a significant unemployment rate especially among young Italians. Its more recent politics has been quite turbulent. Students will be introduced to some of the foremost experts on topics including the impact of emigration (in Italy and abroad), Italy’s relationship with the EU, Italy’s emergence from the devastation of the World Wars, the influence of the Catholic Church on Italian society and culture, Italy’s tradition of regionalism and its effects on contemporary social, economic, and political institutions, gender in Italian culture, and current environmental issues. Students will be expected to take extensive notes on these talks and provide substantive reflections on what they learn about Italy (from readings, films, discussions, and excursions). There will be extensive use of Rome and sights in Italy that leverage the texts towards a better understanding of contemporary Italy. This course will build upon the foundation of Italian language study completed at HWS prior to the program. A variety of visits to local sites will complement in-class instruction and a series of “labs” will introduce students to various aspects of Italian culture and society. Students with more advanced Italian skills will be placed in an upper level class. This program can accommodate a wide array of students including those studying European Studies, Classics, Food Studies, Media and Society, and History. This program is open to all sophomores, juniors and seniors in good social and academic standing with a minimum GPA of 2.5. Students will be required to have successfully completed an introductory Italian language course along with a Reader’s College orientation course during the spring semester preceding the program. Due to the challenging nature of study abroad, student academic and disciplinary records will be carefully screened. Program-related excursions vary from year to year depending on the courses offered and the interests of the faculty director(s). The program typically includes a combination of overnight excursions outside Rome, designed to provide students insight into other areas of the country, and day trips to important sites in and around Rome. Visits to Campania (including Naples and Pompeii) and the Appian Way are tentatively planned for Fall 2019. Students will be charged standard HWS tuition and fees, room fees, and a $600 administrative fee. This will cover credit for a four-course semester, health insurance, housing, and program-related activities and excursions. Note that no HWS board fee will be charged. Students should plan to bring their board fee to cover meal expenses throughout the program. Additional expenses not covered include airfare, visa, books, and personal expenses (laundry, entertainment, ground transportation, and independent travel). We estimate airfare for this program at $1000-$1200 from the East Coast, visa at $50, and books at $250. It is difficult to give an accurate estimate of personal expenses because student spending habits differ considerably. We would suggest a minimum of $1500 above and beyond meal expenses. However, students on a tight budget should be able to manage with less. If you are concerned about finances we strongly encourage you to talk to the CGE staff who can offer information and advice based on your specific situation.